I've just checked that - firing the RCS for 10 seconds gave me 5.4 ft/s additional velocity and I saw all four backward firing jets go off. Indeed, I didn't press enough long on the keyboard touch apparently. I thought that it was on/off with no modulation capacity. Do you get that also? I will do some more tests for the BPV. At which distance from ISS did you try it? Edit: I tested it below 20 kfeet and it worked well sense wise. You can't look at the thruster firing visuals, there is only one flame visual that will be shown whenever one of the backward (sideward, downward, upward,...) firing thrusters is active, you need to look into the FDM firing properties to see which ones ignite (in theory they can ignite fine without a visible flame if the animation part is buggy). I got the 0.6 fps² ish when pressing the translation button long enough, thanks. Can't do anything without more info like a log message, anderror or something similar, the commandline used, some system specs,... as it doesn't happen here, sorry. 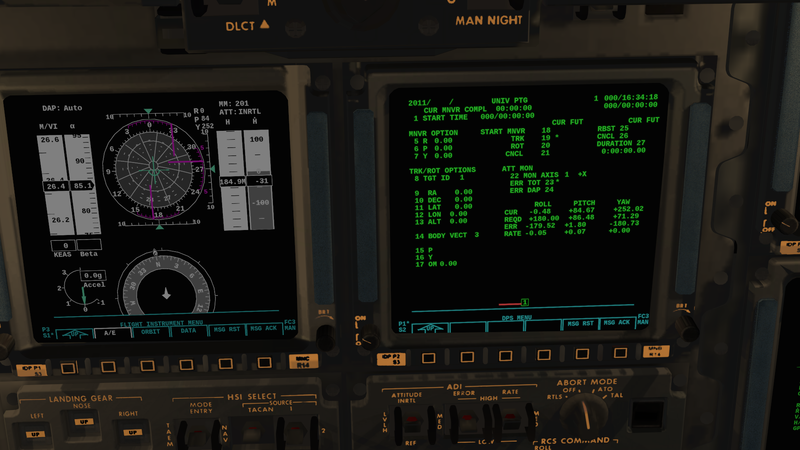 I have some issues with some windows in the spaceshuttle, git version, compiled against the commit tagged 2019.1.1 in simgear, flightgear and flightgear-data. 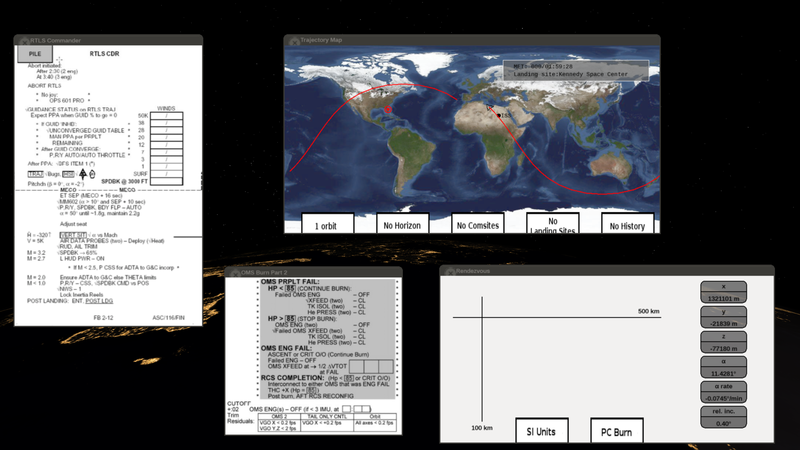 simgear is compiled against openscenegraph version 3.6.3. The same shuttle version is working fine within 2018.3.2 (up to orbital.nas), shall I report this on the dev mailing list, does someone know if we support OSG 3.6.3 for 2019.1.1? Yes please, if it is a clear core regression that sounds like it needs to be reported. Thanks kitty for the post. That cannot be correct, because the -Z axis of the Shuttle is actually pointing towards the correctish direction as far as I can guess, But rolling by 180 deg and yawing by 180 degrees should put the -Z axis of the Shuttle towards the exact opposite direction from the ISS. I have other issues related to joystick and rudder, which now I understand kill my first ISS reaching attempt For instance my pedals are actually locking the keyboard keys for the yaw. If I press the yaw on the keyboard and then release it, the position of the rudder pedals are checked and immediately cancel the yawing rate. Anyone having an ideas where to look to debug this? Internally pointing and tracking runs on vectors because that is the only sane way to do it. The AP simply maximizes the dot product of a target and the axis vector. So there may be any number of signs off and any number of angles not properly normalized in what is displayed, but since it's all done after the fact, nothing of this affects how the AP works, because the AP does the sane thing and makes a dot product of vectors. There's nothing to debug - software can't guess your intention and deal with conflicting control input. If you don't need rudder HW, unplug it and use the keyboard. There's nothing to debug - software can't guess your intention and deal with conflicting control input. I have a lot of questions while attempting a fly around from rbar above ISS to rbar down ISS, but first, something new happened. I lost the radar and DPS at some point while manoeuvring. 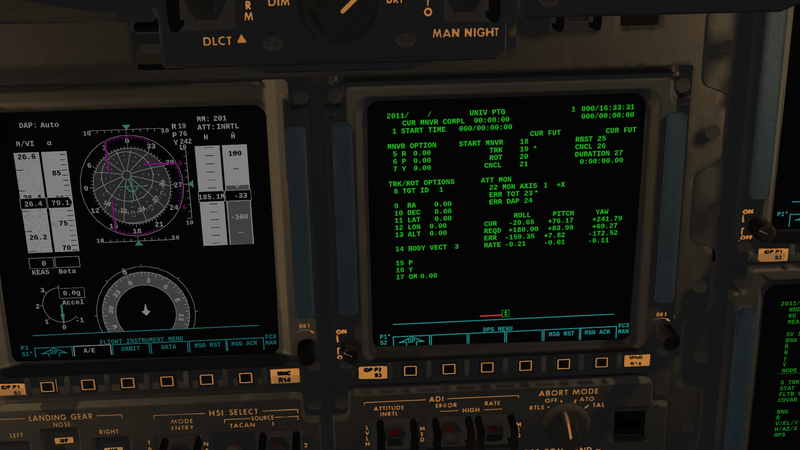 I was 600 fts from ISS and the console complains with this at the same time. With what command line do yo start guys for resuming?